As many of you know, the Joint Commission and other regulatory agencies that accredited Hospitals for the Centers for Medicare and Medicaid Services (CMS) will soon be using the 2012 edition of NFPA 101 during surveys of health care facilities. When the 2012 edition of the LSC is adopted one of the more important sections that Hospital facility managers will have to comply with, is the annual fire door inspection and smoke door inspection requirement. Beginning with the LSC you will have to navigate several chapters such as Chapter 19.2.2.2.1 of the 2012 edition of the LSC, which sends you to Chapter 7 7.2.1. Section 7.2.1.15.2 requires compliance with both NFPA 80 Standard for Fire Doors and Other Opening Protective’s (2010 edition), and NFPA 105 Standard for Smoke Door Assemblies and Other Opening Protective’s (2010 edition). The testing and inspection requirement is repeated in section 8.3.3.1 in the 2012 edition of the LSC for fire doors. Fire-rated doors are an integral part of a building’s overall fire protection. A properly operating fire door is a key component to stop the spread of deadly fire, smoke, and toxic fumes and gases. Fire doors that are used on a day-to-day basis increase the likelihood of a fire or smoke door not being in optimal condition to protect occupants in the event of a fire. In Healthcare and other organizations, people could and have lost their lives in the very settings where they work and often the significant contributing factor is fire doors. 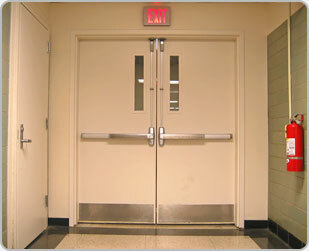 Fire doors and fire door hardware are subject to failure due to the constant usage they take in high traffic areas. Constant usage can lead to misalignment of the door, which could potentially lead to failure of the door to close in the event of a fire. Other common non-compliant issues are holes or openings in the fire door assembly, improper gaps, missing and painted labels, failure of latching hardware to operate, missing screws, door coordinator operates improperly, non-working self-closing devices, missing gasketing, improper kick plates (protective plates) sizes, improper field modifications, and numerous other problems. In recent surveys, many local AHJ’s are requiring fire door inspections and there has been a lot of educational seminars and publicity about the annual inspections required for fire door assemblies. However, there is another “element in this detail” we must also be familiar with – the inspection and testing requirements for egress doors. 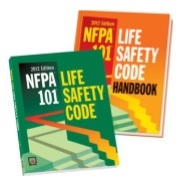 These requirements were added in the 2009 edition of NFPA 101 – The Life Safety Code, and are also found in the 2012 edition. In the 2012 edition of NFPA 101, fire door inspections are covered in section 7.2.1.15 – Inspection of Door Openings. Inspections of specified egress doors are required not less than annually by NFPA 101 if so stated in chapters 11-43 – the occupancy chapters. Specific occupancy chapters which refer to section 7.2.1.15 are Assembly (12.7.1.3, 13.7.1.3), Educational (14.7.3.3, 15.7.3.3), Day-Care (16.7.3.4, 17.7.3.4), and Residential Board and Care (32.7.7, 33.7.7). Two other codes that reference section 7.2.1.15 also addresses the annual inspection of fire doors (performed in accordance with NFPA 80) and smoke doors performed in accordance with NFPA 105 for fire doors and smoke doors in all occupancy types. Healthcare facilities will be required at a minimum to perform “annual fire doors inspections” of all fire doors, because the 2012 edition of NFPA 101 references the 2010 edition of NFPA 80 – Standard for Fire Doors and Other Opening Protective’s, and NFPA 80 has required annual inspections of fire doors since the 2007 edition. Hospitals now are required to comply with NFPA 80-1999’ edition which has no annual requirements for fire doors. As a Healthcare manager, we now inspect the fire doors for compliance for accredited agencies and to be in a state of readiness with the NFPA 80-1999’ Life Safety Code. Fire door inspections are achieved today through the “Statement of Conditions”- Life Safety Assessment Part 3 process and the inspection frequencies are identified in Hospital policy, as building conditions change or through the organizations building maintenance program. Door leaves equipped with panic hardware or fire exit hardware in accordance with 7.2.1.7 – panic hardware is required by NFPA 101 for doors in Assembly, Educational, and Day Care occupancies serving an occupant load of 100 or more, but this inspection requirement also applies to other doors that are equipped with panic hardware or fire exit hardware where not specifically required, according to the NFPA 101 Handbook. Door assemblies in exit enclosures – typically stairwells and exit passageways. Electrically controlled egress doors – electrically locked doors that are released by a door-mounted release device such as panic hardware with an integral request-to-exit switch.  Door assemblies with special locking arrangements subject to 7.2.1.6 – includes Delayed Egress Locking Systems (7.2.1.6.1), Access-Controlled Egress Door Assemblies (7.2.1.6.2), and Elevator Lobby Exit Access Door Assemblies Locking (7.2.1.6.3). For Residential Board and Care, the requirements apply to doors, which are required to swing in the direction of egress – typically doors serving areas with an occupant load of 50 or more, and doors used in an exit enclosure. Creating a Door Inspection program for doors in the specific locations will ensure that doors used most frequently and are more prone to wear and tear are operating properly. Similar to the NFPA 80 standards for fire door inspections, door assemblies must be visually inspected from both sides of the opening to assess the condition. Functional testing must be performed by individuals who can demonstrate knowledge and understanding of the type of doors subject to testing. A written record of the fire door inspection must be signed and kept for review by the Authority Having Jurisdiction. Documentation by qualified staff is providing an enforcement tool to confirm that the inspections are done properly. Any deficiencies noted during the inspection must be repaired or replaced “without delay”. In addition, when deficiencies are noted an Interim Life Safety Measure decision needs to be implemented or not must be made. There is a set of guidelines in NFPA 80 for a written performance-based program, which allows the inspection period to exceed 12 months, and this can also be applied to egress doors. Fire Door inspection programs beyond the minimum requirement of not less than annually, Data below published by Door Security & Safety Foundation may help you in establishing your fire/smoke door inspection frequencies. We now know that Fire and Smoke Doors play a critical role in the passive fire protection of building occupants. NFPA publishes research data titled Selected Published Incidents Involving Fire Doors. As you read the NFPA reports we can see that operational items such as the fire door didn’t operate due to lack of maintenance, absence of correct fire door rating in wall opening, fire door held open by a wedge on floor, holes in fire door causing spread of smoke from fire and so many more examples are noted within the NFPA report. The report includes articles from NFPA publications about fires involving fire doors. Included are short articles from the “Firewatch” or “Bi-monthly” columns in NFPA Journal or its predecessor Fire Journal and incidents from either the large-loss fires report or catastrophic fires report. If available, investigation reports or NFPA Alert Bulletins are included and provide detailed information about the fires. These reports are available to NFPA members at www.nfpa.org/osds. Floor space on both sides of the openings is clear of obstructions and door leaves open fully and close freely. Forces required to set door leaves in motion and move to the fully open position do not exceed the requirements in 7.2.1.4.5. Latching and locking devices comply with 7.2.1.5. Releasing hardware devices are installed in accordance with 7.2.1.5.10.1. Door leaves of paired openings are installed in accordance with 7.2.1.5.11. Door closers are adjusted properly to control the closing speed of door leaves in accordance with accessibility requirements. Projection of door leaves into the path of egress does not exceed the encroachment permitted by 7.2.1.4.3. Powered door openings operate in accordance with 7.2.1.9. Signage required by 7.2.1.4.1(3), 7.2.1.5.5, 7.2.1.6, and 7.2.1.9 is intact and legible. Security devices that impede egress are not installed on openings, as required by 7.2.1.5.12. Clearances under the bottom of the door cannot exceed ¾ inch, and if the door is mounted more than 38 inches above the floor, then the clearance cannot exceed 3/8 inch. Clearances between the top and vertical edges of the door and the frame cannot exceed 1/8 inch for wood doors, and must be 1/8 inch (+-1/16 inch) for steel doors, as measured on the pull side of the door. Smoke door assemblies must be inspected annually. Doors must be operated to confirm full closure. Hardware and gaskets shall be inspected annually, and if any parts found to be damaged or inoperative must be replaced. Tin-clad and kalamein doors shall be inspected for dry rot of the wood core. A written record that is signed and dated by the knowledgeable individual performing the inspection must be maintained and made available to the AHJ. The Authority Having Jurisdiction may require annual inspections for additional doors if he or she determines that there is a hazard to building occupants. Annual inspections of rated fire doors, means of egress doors, and smoke barrier doors will help to ensure that they perform as designed, tested, and required by code and in turn protect the building occupants during a fire. Even if the annual inspection requirements are not being enforced in your jurisdiction, Healthcare facilities managers should consider inspection and testing of all fire rated fire door assemblies as a best practice. One-Stop Data Shop go to www.nfpa.org/osds.